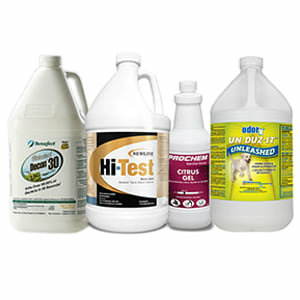 Sinclair Cleaning Systems is pleased to offer a complete line of chemicals and cleaning solutions for carpet cleaning, hard surface cleaning and upholstery cleaning. We also have a wide range of chemicals used in disaster restoration to combat smoke damage and mold issues. Car detailers also love our cleaning solutions which allow for fast, safe and efficent cleanup of all vehicles surfaces both inside and out. Both homeowners and professionals know how difficult it is to eliminate strong odours such as urine smell. We have the chemicals you need to eliminate all types of odours safely and quickly. We have just the right products to attack tough spots and stains such as red wine, blood and grease. Be sure to protect your cleaned carpets with Scotchgard and seal cleaned stone and tile surfaces using our line of sealing products. Click the following image to learn more about our suppliers.